I got to Hollister a little before 5pm and found the show room pretty empty. It was looking like a lot of people wouldn't show up, but I think by Saturday morning most of them did. I took 12 birds. Numbers seemed to be down a bit this year. I got the birds cooped in, fed, and watered, and had some dinner at the show hall with a small group of friends, then headed back to my hotel room and got into jammies and watched TV for a while until D.W. finally arrived and came over for drinks and chit chat. Barely slept Friday night (can't sleep in hotels, ugh!) and got up early Saturday morning. I got my birds cleaned up as best I could, and to my dismay discovered that one of my black pullets had molted most of her neck feathers overnight. Cripes! What is up with that?! My pullets are molting neck feathers right now, but I was relieved to hear it's not just my crazy birds doing that. I spent the day talking to people and looking at birds, and sometimes sitting there by myself wondering where the heck a couple of my friends disappeared to because I really wanted to talk to them and barely got the chance. Hmpf! I also bought a pair of birds. What? Yeah, I haven't bought birds for about ten years (except that Silver Duckwing Old English rooster a couple years ago). I saw this pair of Black Rosecombs in the sale pens and even though they are past their show prime they looked like really nice birds. I asked the owner what bloodline they are from, and they are from a line that I was thinking about buying and having shipped in, so basically I saved a pile of money not getting birds shipped in. Score! I wasn't expecting to buy anything there but I think it was a wise decision, since I do need to outcross my flock. I was pleasantly suprised to see that one of Black Breasted Red males took Best of Breed, and even more surprised that one of the BBRed females won Reserve of Breed (I had the only Rosecombs there, but this isn't saying much for my blacks I think, lol!) I was REALLY surprised when that BBRed male went on to win the RCCL class. This is the sort of thing that makes ripples and upsets people, because a "colored" Rosecomb is not one that people tend to expect much out of. But I like to prove them wrong, and this show seems to be the place to do it. Last year I had Reserve RCCL with one, and two years ago I won Reserve Grand Champion with one. Woo hoo! Months ago when I was talking to L.R. 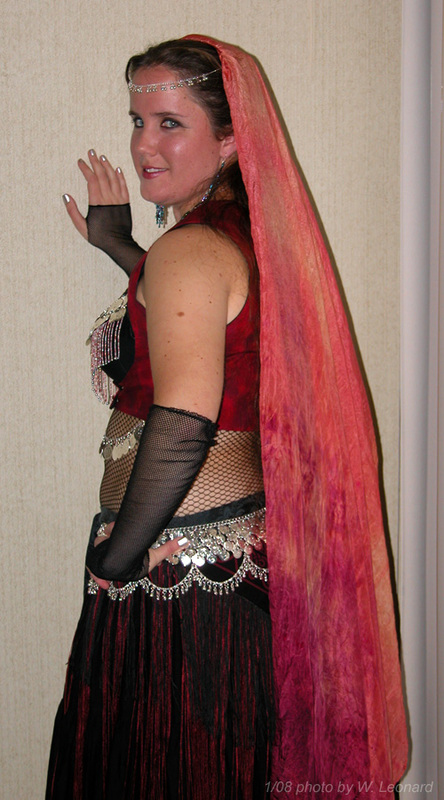 about bellydancing, she asked if I would be willing to do a little something for J.R.'s 70th birthday party this weekend. I had to think about that a bit, since it meant doing a solo performance (C.S. and I put on a very small "private party" show there last year, our debut...) I agreed to do it. So after a very nerve-wracked dinner with D.W. I headed back to my room and spent an hour and a half getting dressed. It's amazing how long it takes to do costume, hair, and makeup, and by the time I finished getting ready I was so nervous and scared I was shaking. It's so much easier to do that with a group of people! I really should have had someone hang out with me just for moral support when I was getting ready, I was a wreck. W.L. came over shortly before the party and took some photos with my camera. He has a bunch more on his camera but I probably won't get those til next weekend. I hope there are some good ones! The first part of the intro song played while I waited outside the door, and then when I heard my "walk in music" start I pushed the door open and stepped inside and seriously I could have just croaked I was so scared. I could see that the room wasn't set up quite as I had planned, so I was going to have to dance in the middle, meaning there would be people behind me. Oh well, I figured that was their problem, they could have moved. The dance itself is really all a blur. I was scared, and I was trying to see who all was there but also sort of afraid to see who all was there. There were about 20 people there. The really good news is that I didn't screw up at all! I was afraid I was going to miss a step but I didn't. The only problem at all was my sleeve got hung up for a second on my belt, but I got it loose pretty quick. I could tell that some people were really enjoying it, and some looked uncomfortable. Maybe because it's me and seeing me do that was kind of shocking? Whatever. Nobody got up and left, which was good! It was way too "close quarters." It would have been nice to have more distance between me and everyone else, but there wasn't anything I could do about that. So it was a five minute slow song and a 1.5 minute fast song, and then I bowed and left and went back to my room and congratulated myself for surviving, touched up my makeup, had a glass of water, wrapped myself up in my veil and headed back over to visit with everyone. Several people got photos with me, and W.L. took a bunch of photos during the performance, but I don't have those yet. In all the excitement last night I forgot to set my alarm, so despite my plans to get out of bed at 7 and be at the show hall at 8, I woke up at 8:15 and a said a string of expletives when I looked at the clock. I was SO glad I mostly packed up last night, because I'd thought about doing that this morning instead. Ugh. I threw some clothes on and brushed my hair and got over there at 8:40, and more than one person told me I looked like hell. Yeah, I pretty much do first thing in the morning... Plus I had slept really poorly again. So I packed up the birds, hugged everyone goodbye, had a totally uneventful and pleasant drive home in the sunny weather, unloaded birds, had lunch, sat down on my bed, and promptly fell asleep for a few hours. I definitely won't be doing that at every show. Next weekend I'll have the art booth there, that's quite enough to deal with! Here are a couple of pics from last night that were on my camera. 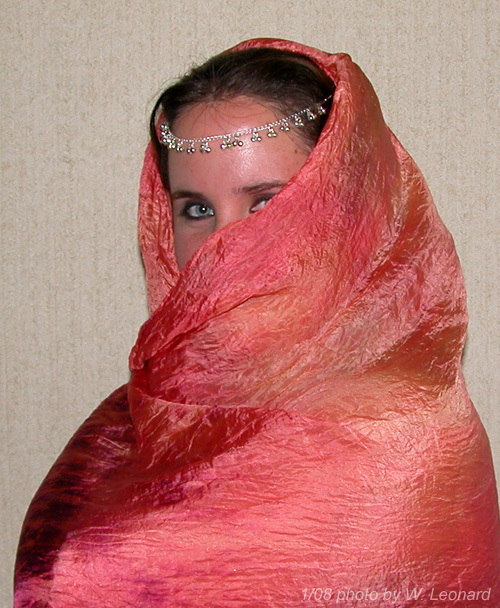 (I made a lot of the costume myself, including the veil). I love veils! Love the costume! Well done for dancing on your own, shame we can't have a video clip on the blog! Lol, thankfully no video was taken! ;-) W. took a bunch of photos of the performance though so hopefully some of them will turn out good. I didn't know it was J.R.'s B'day. I would have had to miss it anyway, since one young man was waiting for a ride home, which didn't get there until almost 8:oo, uggh! I still would have liked to see the looks on some of their faces, rofl. Cool, I didn't even know you did this. Tee hee, yeah it's only recently that this isn't a secret anymore! Oh yeah, it shocked some people... REALLY shocked. LOL!